The look on his face! He LOVES it! You have created an heirloom. And you , my dear, are a superhero mommy! 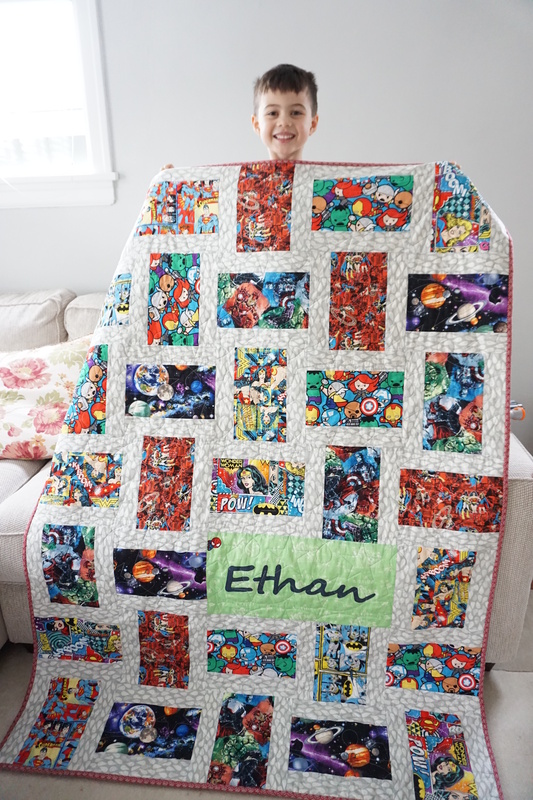 Ethan’s smiles were worth the effort! Such a cosy looking quilt! 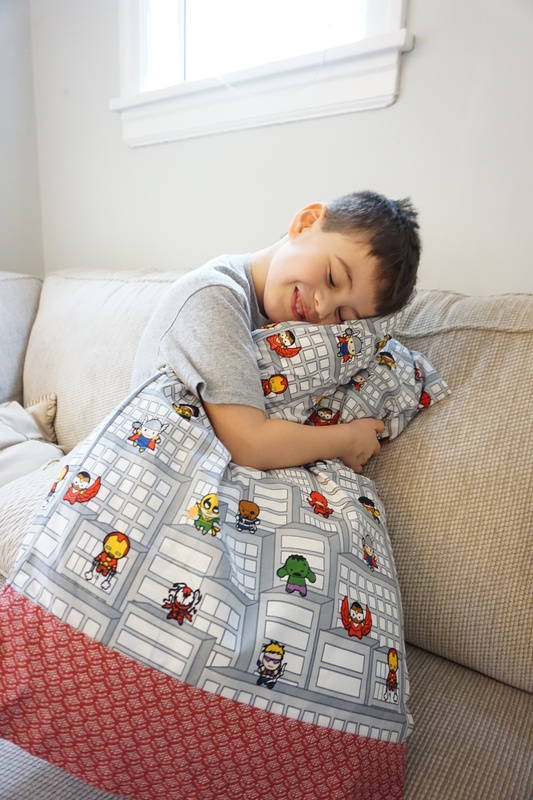 Did you use batting as well as the cuddle fabric backing? Thank you for your kind comment! 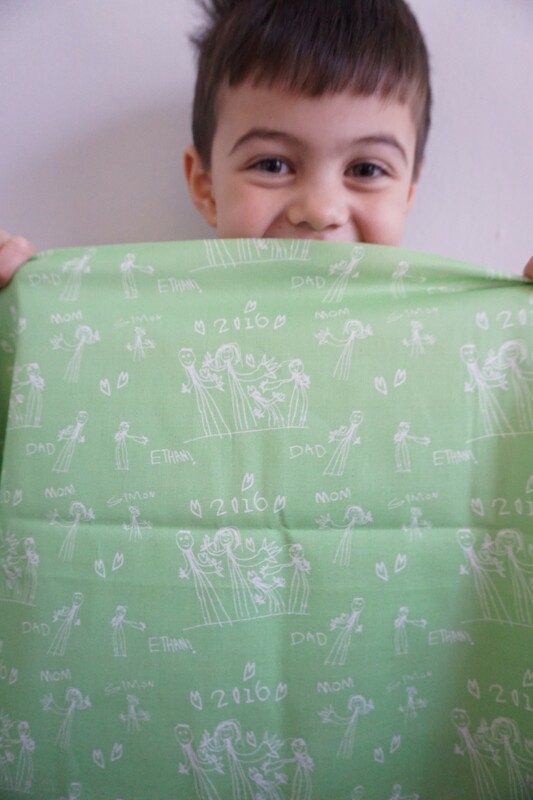 And yes, Spoonflower is so much fun and intuitive! I would definitely recommend trying it out sometime. 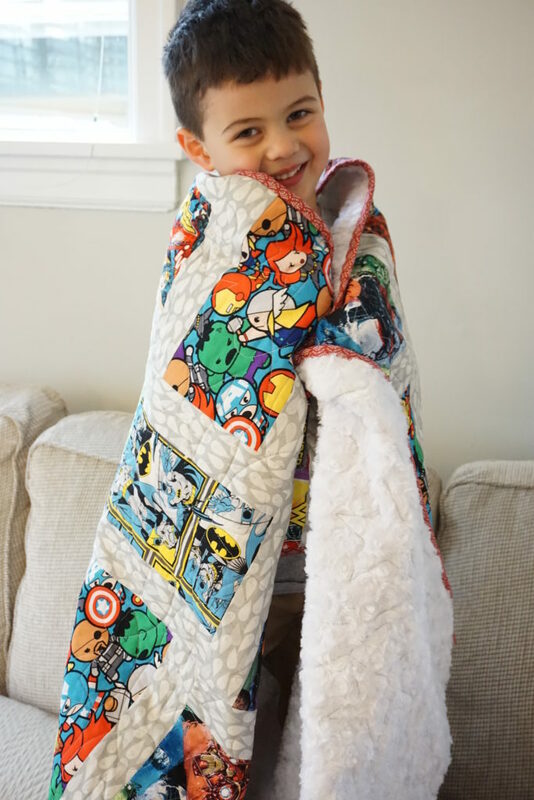 Love the quilt! The smile on Ethan’s face is priceless! You are a super mom! 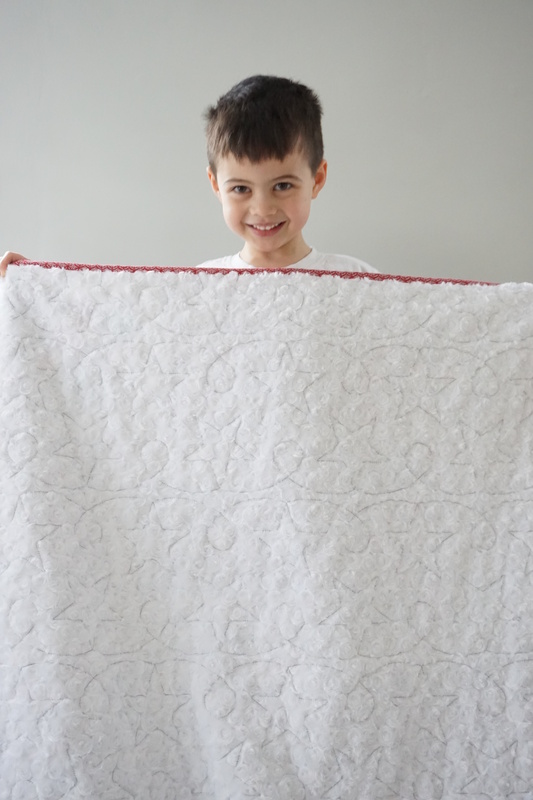 What a terrific quilt! Making things for kids is the best of fun, I think. 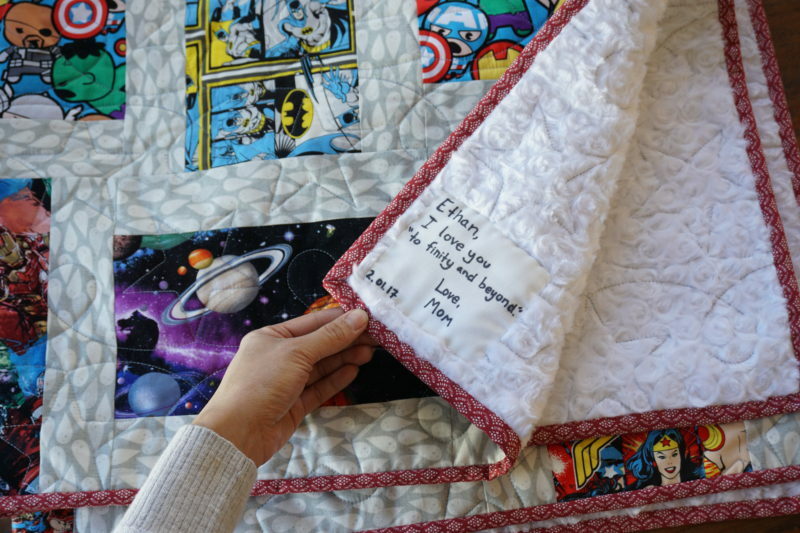 A lot of love went into that quilt. Love it. Your boys are the cutest! 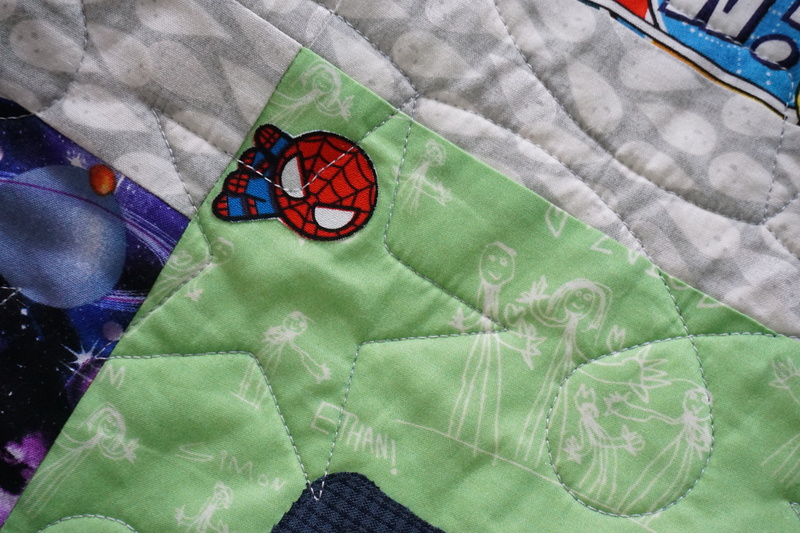 with the quilts I make. Thanks for the idea ! Isn’t it funny how that happens? 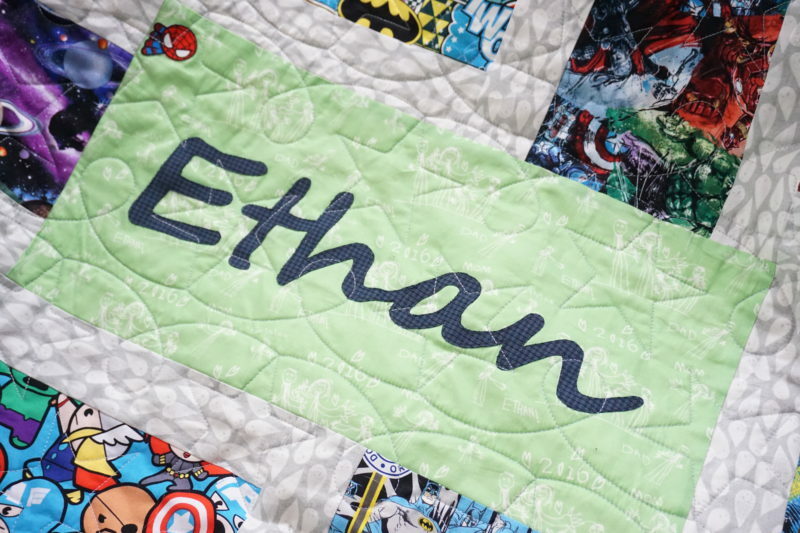 🙂 So far Ethan seems to be using his new quilt equally as he uses blue, lol. Maybe I need to say blue is “in the wash” and see if he forgets, lol. 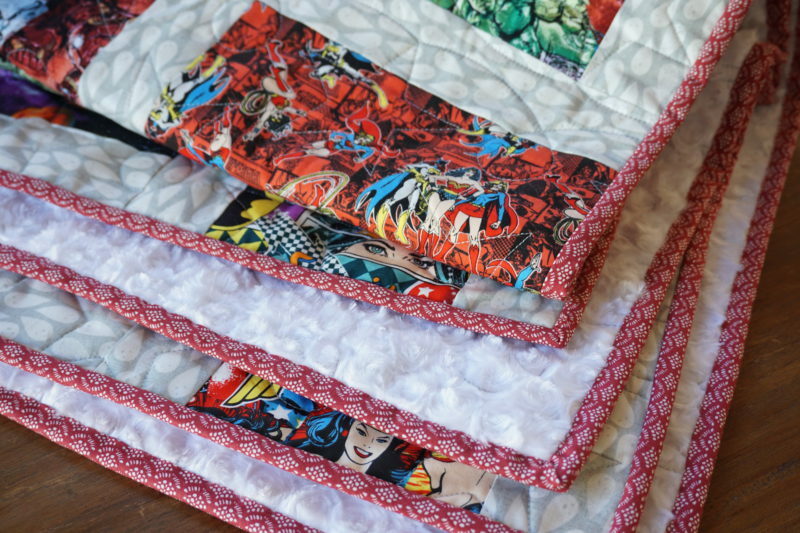 What a perfect quilt for a super hero fan. I just love seeing your Ethan’s face. 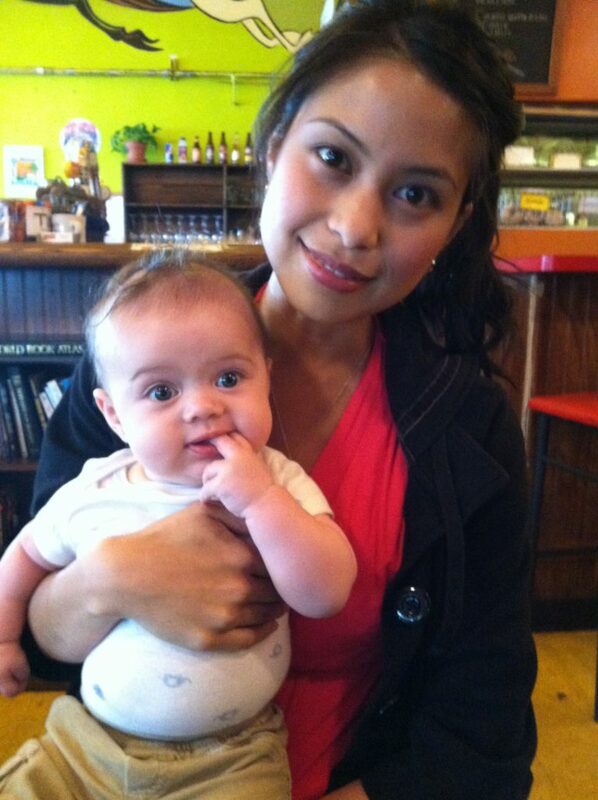 He looks so sweet. A little “hello” to you from the middle of Norway! 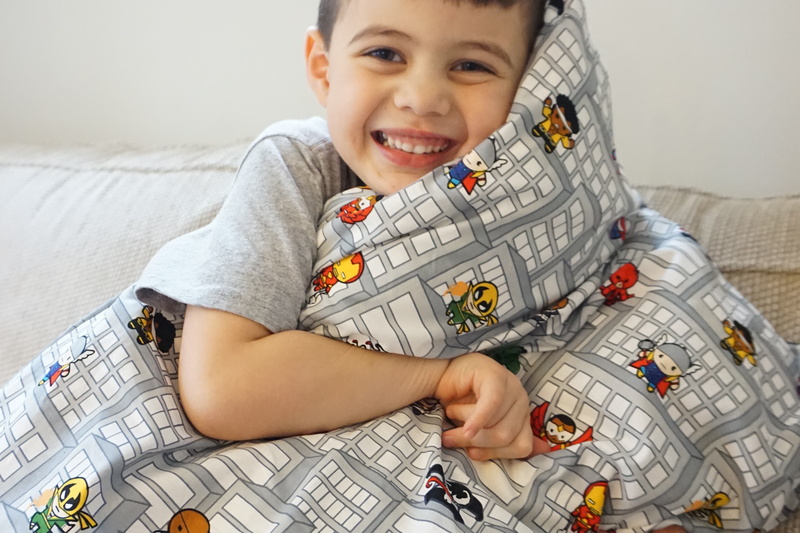 I just love your quilts and the pictures of your lovely boys! 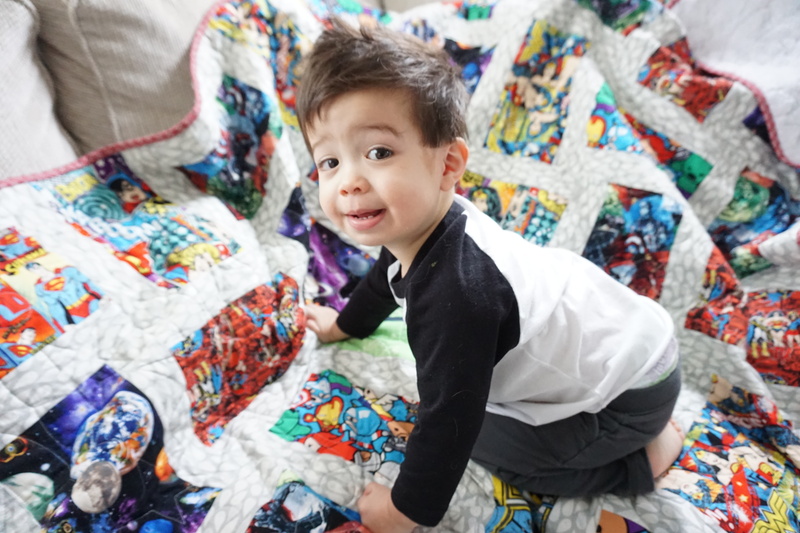 I started following your blog just after you had your first son, and I am thrilled to see him together with the cutest little brother – among all those beautiful quilts! 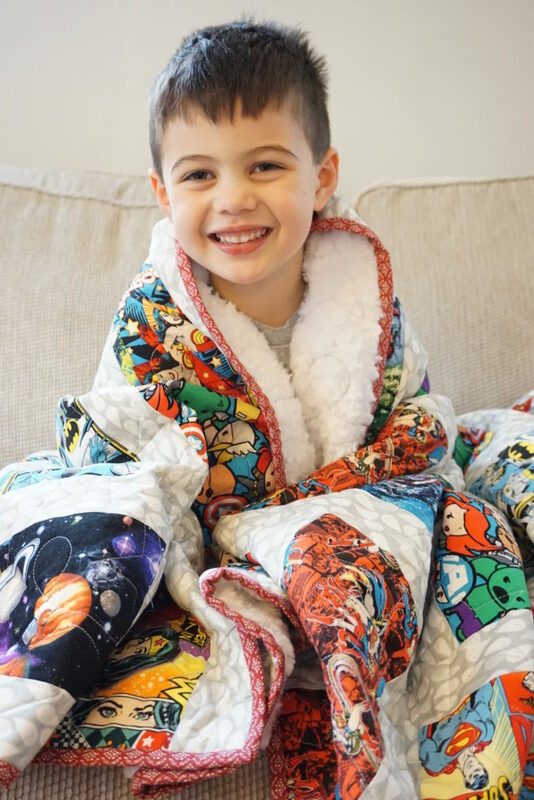 I have two sons myself, and they are now 22 and 24 years old…and the oldest one is going to be a father within few days – my first grandchild – a boy whose name is going to be Filip <3 I would love to make him a blanket, and I´ve got a lot of inspiration from your pictures. But – where can I buy your book? 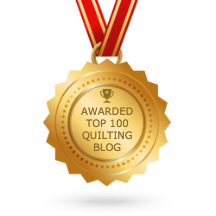 Thank you for your wonderful comment and for following my blog for so long! 🙂 I feel honored. I try to cherish these days with my boys as they grow too fast, as i’m sure you know from experience! So happy my blog has brought some inspiration. You can find my book on Amazon…not sure if you have easy access to that in Norway? Hi. 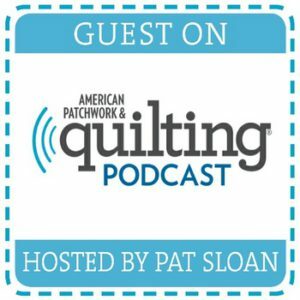 I was trying to reach your friends site itsjustsewing to see about having a quilt long armed but the link doesn’t work and I tried to google it and got the same thing. Is their a new web address? Thank you.